A Hopi maiden, honored with the task of collecting water for their sacred ceremony, steps down the steep, rocky trail to the ancient spring. As she climbs, she recalls the sacred covenant that her people made with Maasaw, the caretaker of the earth. Maasaw entrusted the tribe with the 3 POINTS needed to build a strong society. An ear of corn: representing food for the body and soul. A gourd of water: the gourd being a reminder that the water (from a confined aquifer) is limited so it must be preserved. The planting stick: the simple technology necessary to grow things in the desert. She affirms the covenant her tribe made to be humble farmers, respectful of the land and the water. She bends down to scoop up some water with a gourd. But the water level has gone down so far that she can barely reach it. 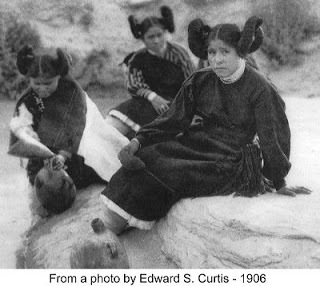 This is one of a few springs still flowing on the Hopi nation. The Hopi tribe is a sovereign nation located in northeastern Arizona. The reservation occupies part of Coconino and Navajo counties, encompassing more than 1.5 million acres. It is made up of 12 villages situated on three mesas. 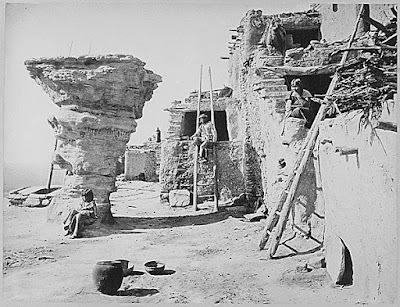 Their pueblo-style villages were settled in 900 AD. It is one of the oldest continuously inhabited human settlements in the Americas and the people still maintain their culture. These resourceful people developed a method of dry land farming that sustained them as long as they kept their covenant to protect the water. In the 1960s, the American government strong-armed the Hopi and Navajo into signing an agreement with the world’s largest coal company. In 1970, Peabody Energy started strip mining their mesas destroying hundreds of archaeological sites. From 1970 – 2005 alone over 45 billion gallons of pristine drinking water was pumped out of their confined desert aquifer to transport slurry (ground coal mixed with water) through pipes to a power generator in Nevada. That was enough water to last the whole tribe of 10,000 for 300 years. The tribe has paid dearly for breaking the covenant to protect the earth and water. Close to 400 million gallons of pristine drinking water is still pumped annually for the Kayenta Mine. Peabody pays them 3/10 of a cent per gallon. Most of the rivers and streams that sustained the tribe since ancient times have dried up or have been polluted by runoff from the mine. The coal is used to run the Navajo Generating Station near Page, Arizona. The Western United States' largest generating system was built to power the pumps that push Colorado River water over 300 miles UPHILL to Phoenix and Tucson as part of the Central Arizona Project. Yes, that’s how we get our CAP water. Because of the name, people think that it is owned by the Navajo people. It’s not. The tribes don’t get any of the water or power. Many people live in poverty with no running water or electricity. They drive 20 miles for drinking water. The U.S. government pronounced their sacred land a national sacrifice area in order to build up the southwest. On top of that, the tribes were cheated out of the fair market value for the land and water. The Hopi receive only two million dollars a year, while Peabody generates $5.6 billion. To put this in perspective, their CEO alone makes three million dollars a year. Before their land was savaged by the mines, these tribes were self-sufficient farmers and shepherds. They are now forced to rely on the mines for roughly 50 percent of their jobs. The remainder are unemployed. 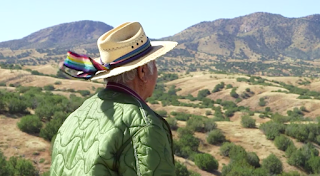 Vernon Masayesva, the founder of Black Mesa Trust, is fighting to shut down the coal powered generator permanently and replace it with solar energy. This fight isn’t just for the Hopi and Navajo people. It is for all of us. The amount of pollution this plant is making is appalling. EPA spokesman Rusty Harris-Bishop confirmed that the Navajo Generating Station is one of the largest sources of nitrogen oxide emissions in the country. It is an UPHILL battle, because many tribe members won’t hear of shutting down the mines, since family members still work there. An honored storyteller, Vernon evokes the revered teachings of the ancients on the 3 POINTS needed to build a strong society: an ear of corn, a gourd of water and the planting stick. He encourages the tribe to renew their covenant with Maasaw to be protectors of the land and the water. 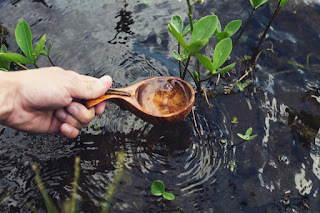 Black Mesa Trust is currently conducting workshops to teach their teens how to harvest the rain water and return to the ancient methods of dry desert farming. The Hopi Raincatchers are using traditional and modern knowledge to build ravines with boulders to restore their watersheds. We have so much to learn about being sustainable in our desert from the Hopi way of life. They share important lessons about protecting and being good stewards of the earth. 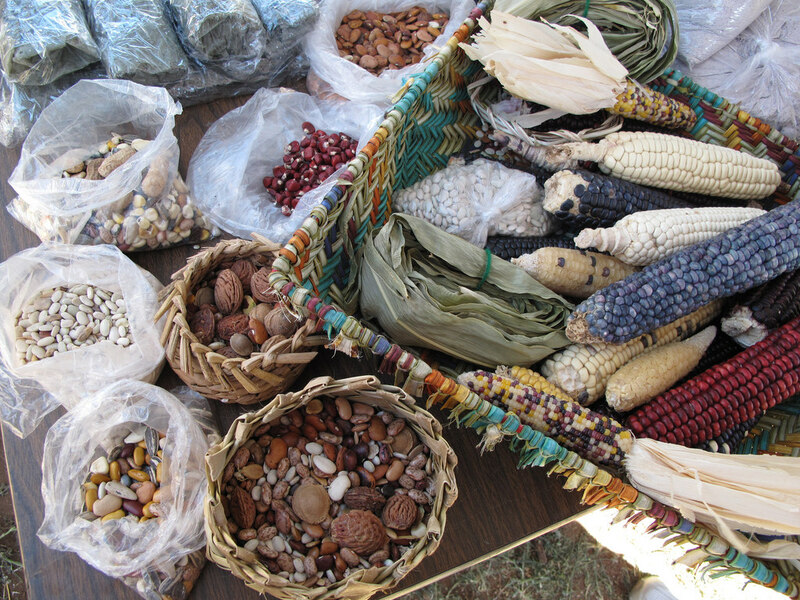 The people of Tucson’s Mission Garden are incorporating similar dry land farming techniques and learning how to grow sturdy heritage plants from the Tohono O’odham. Even after being exploited, the Hopi feel a great responsibility to share what they have learned with the rest of the world. They are leading the Water Movement. It’s time Tucson joined that movement. Recently, poisonous tailings from abandoned mines seeped into the streams that feed the Colorado River. The water in the reservoirs is evaporating at record rates. As temperatures continue to rise and more states experience droughts, there will be even more competition for that water. As we wake up to the reality that we don’t have an unlimited supply of water, there is much we can learn from the devastating impact of coal mining on the Hopi and Navajo lands. Currently, a foreign mining company has plans to build a mine on the Tohono O’odham Reservation. They will take advantage of an antiquated 1880s law and pay the tribe $5 an acre. The proposed Rosemont mine will destroy the desert habitat where the people gather their food, and contaminate their streams and rivers. It will also deplete 20% of Tucson’s ground water. Our representatives are pushing for these mines because they create jobs. But those jobs are temporary. Ask the 400 workers who just lost their jobs at the mine near Green Valley or the Peabody workers whose wages will be decreased to cut back costs as the company reorganizes. Peabody just filed for Chapter 11 protection and is trying to avoid complying with the new pollution controls. But that won’t stop the company from pursuing more profit by expanding their operations on the Hopi reservation. (The mining company wants to expand, increasing coal production to 5.7 million tons a year and increase the water use by 33%.) It just allows the company to place the burden of cleaning up their mines on American taxpayers. UPDATE: Since this blog was written, Congress passed a law allowing mining companies to dump their toxic tailings into our waterways and not be responsible for the clean up. It’s time to join the movement to preserve our precious water by implementing sustainable desert farming practices and supporting a transition from fossil fuel energy to solar power. Let’s unite with our indigenous brothers and sisters and proclaim our Declaration of Water. What we do to water, we do to ourselves. 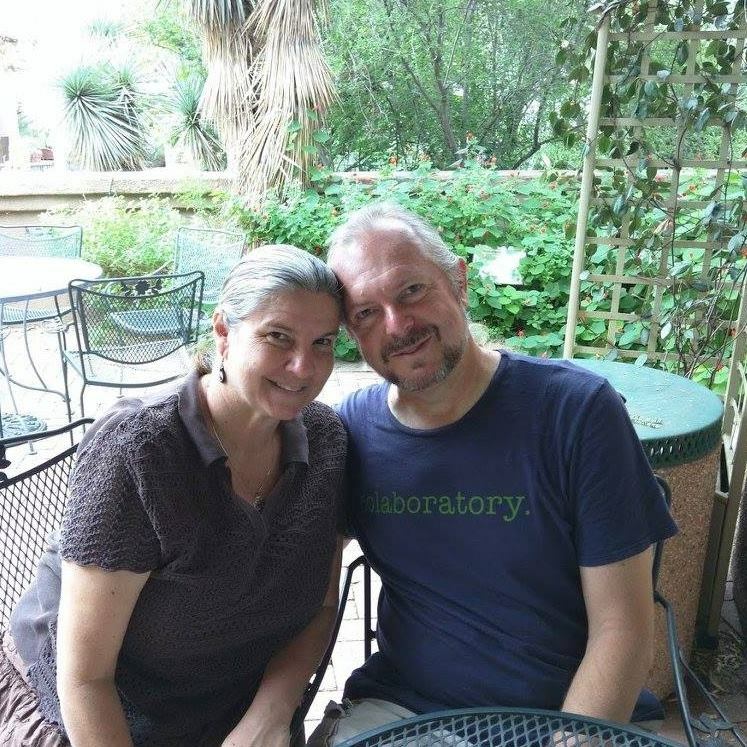 Here's how you can help Black Mesa Trust. Jana, great post. This is exactly the sort of in-depth look at issues affecting all of us and our future on the planet that too many people refuse to take. You are making it easier for even the busiest, laziest, most apathetic to see the real threat to the one resource other than oxygen that we can significantly impact through our collective choices. There are so many threats to water, as you listed in your post, and when one considers that you are only looking at tiny fraction of the world the scale of the danger becomes even more apparent for me. I really appreciate what you are doing here. Thanks for taking the time to write this well researched post. Water is life, and this post should be a wake up call for all! Thanks, guys! And thanks for posting this article on your facebook pages! It really helps to get the word out there! Every facebook "like" helps! There is actually a viable solution! The Black Mesa Trust is working towards closing the coal plants and switching them to solar power. That is totally doable. Our representatives need to put the billions of dollars we spend in subsidies to fossil fuels into adapting the plants to use solar energy. We will conserve so much water that way and not pollute the air!